Twilight Aged Care is a not-for-profit, community based aged care provider with 100 years of history behind it. Throughout that time, they have evolved and adapted to changing economic and legislative environments – their continued success has depended on it. Over the last three years, the aged care industry in Australia has suffered from a challenging financial environment and substantive policy changes. As it has for a century, Twilight Aged Care has survived and prospered by being flexible and adaptable in governance and strategic vision. When the financial crash first happened, Twilight Aged Care restructured their portfolio. In the short term, Stuart says the balance sheet took a bit of a hit. In the long term, however, it helped them to endure the volatility of the market and come out as strong as ever. One example of that strategy was being very proactive in ensuring their documentation supported the claims they make in terms of subsidy payments. Stuart figured that the Department of Health and Ageing would put an increased focus on validation of claims – which has proved true. After not having a validation in a year and a half, Twilight Aged Care was subjected to three in as many months. “Changes happen, it’s about how you deal with them,” he continues. 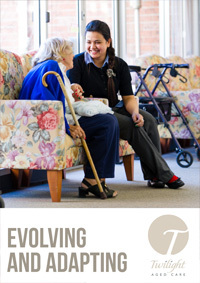 “To be a thriving aged care company, the leadership need to be very active and proactive in managing the environment they are operating in.” That’s what Twilight Aged Care has done – become proactive. Directors is chaired by John Laurie, an experienced and well respected leader within the business community of Sydney. The rest of their Board holds a range of skills that encompass legal, medical, business, and finance. That flexibility and agility benefits residents because it means Twilight Aged Care is able to deliver on their promises. Their central mission is to provide a home-like environment that is welcoming to families but also delivers a high standard of care. In order to execute on that vision, they need to make sure the company is viable, which is what being flexible is all about. Twilight Aged Care employs approximately 160 people. At the ground floor, Twilight’s staff is also talented and dedicated, and without their efforts, the organisation would not have made it as far as they have. Stuart credits Twilight’s exceptional corporate culture to their ability to work with people. They have a culture of growth within the organisation. Two staff members recently celebrated 15 years with Twilight Aged Care. They both started as kitchen hands – one of them is now the admin assistant for one of their homes and the other is their activities officer. Another staff member who started as a cleaner is now the company Environment and Health & Safety Manager. Twilight has also assisted their nursing staff over the last few years to earn qualifications in aged care. Stuart says “growing your own people” is a rewarding exercise that brings long term benefits in terms of employee satisfaction and retention. The company also supports staff by offering flexible working hours, working hand-in-hand with them to ensure their duties at the company fit in with their own family requirements. Even more, they host parties and social events, particularly around resident functions. In recent example, one of their residents turned 100 – making four centenarians living at Twilight – and the staff put together “the most wonderful party,” Stuart says. 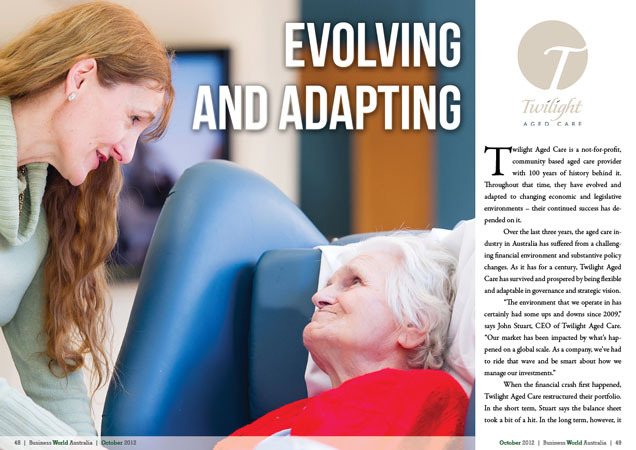 Moving forward, Twilight Aged Care will continue to evolve and adapt to changing market conditions. As baby boomers have entered the aged care sector, for example, the expectations of consumers have steadily increased and Twilight has had to keep up. A lot of their money goes into upgrading their facilities, to ensure they all look pleasant and appealing. They also communicate very closely with families to ensure that their expectations are understood and they know what can practically be provided.